Christine Bilbrey: So joining us know we have three excellent guests and they just got out of our Tech CLEs, so they have been sharing with our members. I have Christine Falcicchio, Ian O’Flaherty, and Tara Cheever. So I am going to start with Christine and I want you to tell our listeners where you work and what you do. Christine Falcicchio: Sure. Hi Christine. My name is Christine Falcicchio. I am an attorney here in Florida and I have a company that’s called Strut Legal, and what we do is we specialize in creating hyperlinked briefs for the courts. So they are sometimes known by different names, eBriefs or interactive briefs or hyperlinked briefs, but it’s all the same thing. And basically what we do is we submit supplemental copies of the briefs that are much easier for the courts to review, because they have hyperlinks to all of the supporting materials, so my job is creating things that help judges and arbitrators to make their lives easier. Christine Bilbrey: Excellent. And Tara, tell our listeners what you do. Tara Cheever: Sure. I am the Products Manager at LIT SOFTWARE. We are the creators of three apps for iPad for litigation specifically; DocReviewPad, TranscriptPad, and TrialPad, and as you might be able to guess by the names, DocReviewPad is for document review. TranscriptPad is for transcript review and TrialPad is for organizing your case and then presenting it at trial, but obviously mediation, a lot of times at depositions as well. So that is my job. My job is to promote the apps and show how useful they are and how easy to use they are and that’s it. Christine Bilbrey: We love all that technology. And Ian, tell us about you. Ian O’Flaherty: Hi there. I am the Founder and CEO of LIT SOFTWARE, so I am responsible for the design and development of the apps, the direction it takes, and get feedback from all of our users to see how they want it developed, what features they want added, and Tara works closely with me on that, and that’s really it. Christine Bilbrey: So Tara, tell us what were the important points that you shared with the CLE attendees today. If they are interested in being able to show up to court with their laptop or iPad, what are your apps doing for them? Tara Cheever: Well, I mean our apps are based on iPads only, and the reason is because the one main takeaway that I want all of our CLE listeners to take away from it is that, if you have software and you can’t use it, it’s pointless. So the idea of having software is to have software that’s easy to use, and that’s something that has kind of become my mantra. So a lot of attorneys will say, oh, I am not just tech savvy, I don’t get it. And in today’s modern age it’s not you, it’s the software. If you can’t pick it up and automatically understand how to use it, then it really probably isn’t for you, and it maybe isn’t the right kind of software at all. So the reason why we developed for iPad is exactly that, very easy to open and very easy to boot up, if I can use that ancient term, and then it’s a touch screen, so you point and shoot and it works. So that’s the main takeaway, software that you will use. Christine Bilbrey: So it’s very intuitive. Christine Bilbrey: So there’s not a giant learning curve. Does your company, do you have tutorials, how do you get someone up and running if they take advantage of your apps. Tara Cheever: Yeah, that’s a great question. Most of our apps when you open them you should be able to be using them within 15 minutes. Now, there are layers, so you will be able to use the basic functions and then as you start using it’s kind of — it’s not really gamification, but that’s the word a lot of people like to throw around. It’s fun to review a transcript with TranscriptPad. You can open a transcript. It’s very easy to type a question, the end of the answer, and then all of a sudden you are presented with some options. Do I want to highlight this, do I want to create an issue code, and how do I get all this stuff out. There is a little button called Reports. So within five minutes you get the basic functions of the app. Soon you will be maybe pressing and holding a little bit too long and you will see, oh, there is three more options. Now, all that said, every single one of our apps comes with a PDF user guide in the app that you can printout if you want to continue to kill trees, or that you can just open up on a different screen or you can export, email to someone. And then if it really comes to it and you would like to get together with a group, a lot of law schools are using our apps for practice on classes and so they will have us get online with them and then do a class, and a lot of their students are using it. So we do have a training arm, but it’s really infrequently used, just because they are just so easy to figure out. Christine Bilbrey: And Ian, how long has your company been around, how long have you have been providing this? Ian O’Flaherty: We started LIT SOFTWARE in 2010, shortly after the iPad was introduced and we started developing it in the summer of 2010, and since then we came our with TrialPad in December, then a year later TranscriptPad and a year-and-a-half later DocReviewPad. So it has been a short time, but a very rapid development in features and capabilities. Christine Bilbrey: So Christine, tell us, are you working with the court or what side are you on, is this something that attorneys access or are you strictly something that you are working with the judges? Christine Falcicchio: Sure, good question. So what our role is, is we actually work directly with the attorneys when they are planning to present one of these to the court and they come to us in a few different ways. It first started — actually the eBrief world kind of started back in about 1999 and it was when an attorney had the idea of, can you this, is this something that can be done. And from there it’s now kind of — we have seen the transition to where courts and judges and arbitrators are actually requesting these, and sometimes even requiring them. So it’s really kind of made that transmission. But essentially yes, on my end what I am doing is I will work with an attorney. We prepare the eBrief for them and then we will either coordinate to have them send it on to the court or we help with that too. So we are kind of on the team of the attorneys and helping them to present a more cohesive package to the court. Christine Bilbrey: And I can imagine that the judges love that. I can see why they would require it, because for one thing there’s no more like bluffing through your objections. You either have the case or you don’t have the case and so everyone knows right then. I love that. And you don’t have to have it word for word off the top of your head. Everyone has access to it. That’s great. Christine Falcicchio: I have actually been creating eBriefs since 2005, and my partners and I, who own Strut Legal, we were actually part of a larger company who offered some other services as well, like trial presentations and jury consulting, but we broke away and now our company Strut Legal focuses exclusively on hyperlinked briefs, and it really is because there is such a demand for it now that it’s been enough to kind of fill up all of our time in creating these. And again, we work with clients here in Florida, but then also across the country and even internationally too. So it’s really kind of caught on, and as you mentioned, it’s really sort of driven many times by the judges and arbitrators reaching out and saying, hey, this would help me do my job so why don’t you give me one of these. Christine Bilbrey: And when someone comes to you to do this, are they doing it on a case-by-case basis or is it a subscription? Christine Falcicchio: It’s a case-by-case basis and again, it will kind of vary because of what venue the attorney is in at the time or the status of the case, so it’s not anything where they are kind of locked into work with us, but we do — that’s actually our biggest source of our clients, it’s repeat clients, and then it’s also a lot of firm referrals or colleague referrals. So most of our work kind of comes from that word of mouth of, once you use it, you sort of get hooked, and that’s a good thing and you keep coming back for each subsequent case and you prepare another eBrief. Jonathon Israel: And is it completely hands-off for the attorneys, so they just give you all their documents and you take it from there or is it something like a software that you teach them how to use? Christine Falcicchio: Yeah. So what we are doing on our end is we are actually doing that work for them, so it is, it’s something where it’s kind of — they might want to do this, but not have the time or the resources internally to do so. So it’s really just a matter of you give us the files, we figure it all out, we put it altogether and we give you that nice pretty package in the end. So it’s definitely a service that we are offering. Tara Cheever: In terms of skeptical, I don’t know if we did have anybody that was skeptical. Ian and I earlier were talking a little bit about just generally what we have heard of people using it, and I didn’t speak to anyone in the room about it just now, but I was on a call with an IT professional from a really big firm in Oklahoma not too long ago, and he was saying, I would like to deploy your apps. I said that sounds great. And he said the reason why, after we had been talking for a while, is because he has attorneys that won’t do anything on their PCs that he has in the office, but that have downloaded our apps and are using them and he is shocked. He is like this is the first time someone has opened up an app and just used it and they are not calling me every five seconds and I am asking if they have turned it off and on again. So that sort of experience that we have, not just from Oklahoma, but different parts of the country, and around the world, it’s really, really, interesting to see, people just not afraid to pick something up, because I think there is something friendly about the iPad that you are not afraid to break it. If you touch things and something goes wrong, you are not going to get that blue screen of death that you are used to or like the little face with the little x’s over the i’s that we have all seen. So I think that that friendliness makes everything that’s on the iPad automatically more approachable, and then just being able to use some of the same symbols that they are used to in, for example, the Mail App or Safari, it makes things friendlier as well. So, they go, oh, little trash can, that must mean delete, something like that. Christine Bilbrey: That’s good. Even toddlers can use the iPad. Tara Cheever: Yeah. Famously, I have a very small nephew who will give me a book and ask me to read it and he will press the front of the cover, like swipe the front of the cover, so we are on the other side of this IPad thing now I think as well. Jonathon Israel: I would imagine a big hurdle is the technology in the courtroom, to be able to actually display the stuff. What kind of feedback have you gotten from the courts about being able to allow this to come in? Tara Cheever: That’s a really great question, because it runs the gamut. There are courtrooms, and even within the three counties that we are in, Palm Beach County right now, and we come up from Miami-Dade. Miami-Dade County’s courthouse, there are some courtrooms there, as historic and beautiful as some of them are, have literally one outlet in the courtroom to plug in. Fort Lauderdale however just built a brand-new courthouse. It’s fantastic. It opened in I think January, and we went in there and it’s plug-and-play. So you sit down at counsel table and there’s a cable that you just plug right into your iPad and we were there testing it. Everything is on every single screen, the juries all have monitors. Generally across the country you have that same exact mix; the federal courthouses are all usually that same plug-and-play wired. There is a county courthouse up in York County, Pennsylvania, and we know one of the judges there who is in charge of the technology in the courtroom and he has put an Apple TV in every single courtroom. So his attorneys walk in and they are presenting wirelessly. They are walking up to a witness, asking them to mark something up on their iPad. It’s a very different experience in a lot of different courthouses. That said, as long as the technology works, judges love it. It’s the minute that the technology gets in its own way that it’s really useless, so that’s the main thing is, does it work? Is the jury able to see and absorb the information? Am I, the judge, able to see and absorb the information? If the answer is yes, then by and large they love it. Christine Bilbrey: Obviously you don’t want it to be a frustration, so that speaks highly of the app. Can you like give us a little bit of a deeper dive into TrialPad, like what can it actually do, once the attorney walks in? Jonathon mentioned that you have to put up some displays. Does it have like the jury selection thing? What are some things in TrialPad that you can tell us? Tara Cheever: So TrialPad is evidence presentation and it’s hard. You bring up a document, you might highlight a paragraph, call out that paragraph. You might put two documents side-by-side. You can track whether or not an exhibit has been admitted. You can place an exhibit sticker on it. It’s sort of everything that you would want normally in trial electronically. So there’s a little tab there and as you are admitting documents, you just press and hold on the documents, and it says, would you like to mark this admitted and you press mark admitted, and it tracks that. And each day then you can press the Reports button and create a PDF or even printout a report that says what documents were shown that day, which ones were admitted, what the exhibit sticker was on it, how many pages there were, allows you to show video, edit videos, take a snapshot view. That whole thing that you would normally see in an electronic presentation of evidence is what TrialPad can do. Christine Bilbrey: Okay. And so if someone downloads the app, is there a maintenance fee or is it one-time, what’s the fee structure? Tara Cheever: The fee structure is you buy it on the App Store and it’s on our iPad. Christine Bilbrey: Excellent. Very simple. So our listeners are going to have a lot more questions and we want them to be able to find out from you, since you are the experts on these items, so starting with Christine, how can they find you, your website or if you have social media? Christine Falcicchio: Sure. Our website is probably the best way and it’s pretty easy. It’s HYPERLINK “http://www.strutlegal.com” strutlegal.com, and from there, there’s a contact form where you can reach out to us. And then you can also find our phone number as well, give us a call, we would love to chat with you, and obviously email as well. My email is HYPERLINK “[email protected]” [email protected], so again, all pretty easy, but I think starting out with the website is good. The website is a good starting point because we have a lot more information there as well, a lot of FAQs that first time users may have, so start there I would say and then definitely give me a call. We would love to talk to you some more about potential eBriefs in your future. Christine Bilbrey: Great. And Ian and Tara, how can they reach you and get more information. Ian O’Flaherty: Well, we obviously have the website, HYPERLINK “litsoftware.com” litsoftware.com or by email at HYPERLINK “[email protected]” [email protected] and through Twitter @LitSoftwareApps. Christine Bilbrey: Okay, great. 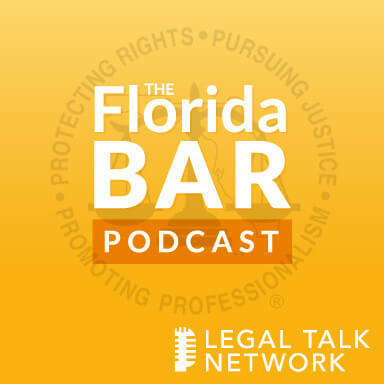 Well, this has been another edition of the Florida Bar Podcast, brought to you by The Practice Resource Institute on Legal Talk Network. I want to thank all of our guests for joining us. And if you liked what you heard today, please find us and rate us on ITunes. I am Christine Bilbrey.